IAUC Circular No. 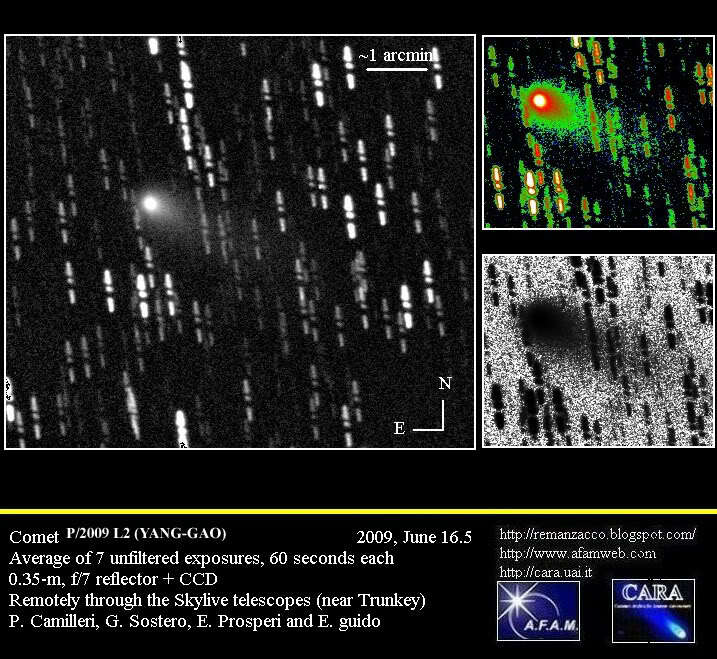 9052, issued on 2009, June 16, announces the discovery by Rui Yang and Xing Gao of a new comet on several survey images taken by Gao in the course of the Xingming Comet Survey at Mt. Nanshan using a Canon 350D camera (+ 10.7-cm f/2.8 camera lens). We have been able to confirm this object while it was posted in the NEO-CP, both from mpc code H06 & E16. Co-adding of 10 unfiltered exposures, 60 seconds each, obtained remotely near Mayhill (NM) on 2009, June 16.4 through a 0.25-m, f/3.4 reflector + CCD showed a coma about 40 arcsec in diameter, and a tail nearly 90 arcsec long toward PA 245 deg. The first preliminary orbit for comet P/2009 L2 (Yang-Gao) indicates perihelion already on May 19, 2009, at about 1.3 AU. The period is about 6.6 years. 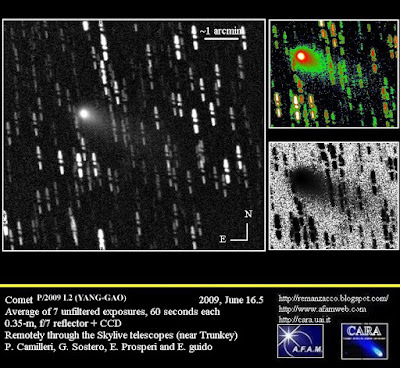 This is the third amateur discovery in 2009, and the second for the Xingming Survey. Congratulations to our chinese fellow observers for this new find.